Please find below a list of the major new features and improvements in AODocs version 49. 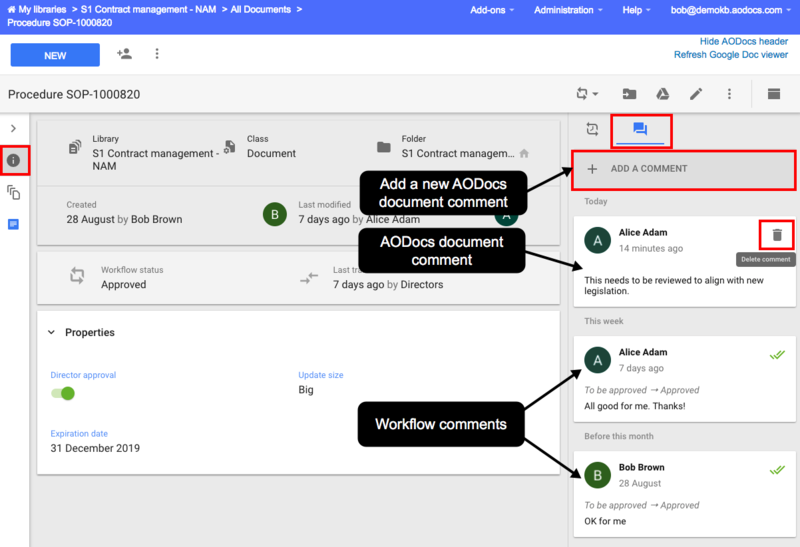 For an improved collaborative experience, all users with the Can comment permission can now add comments directly in AODocs documents, outside the context of workflow transitions. Library administrators can delete these comments. Library administrators can also add an optional comment when they change the workflow state of a document outside the normal workflow process. 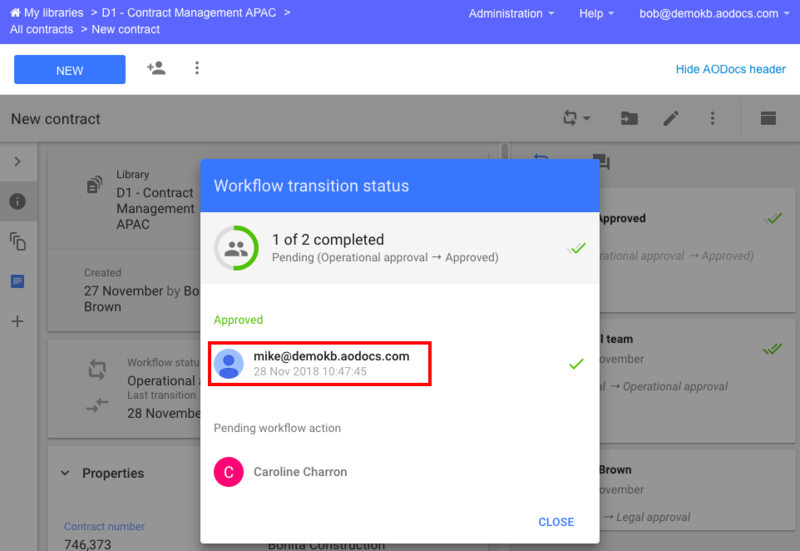 Learn more: Force workflow actions. Finally, when contributors delete a document, they can add a “reason”, which is displayed to administrators who still have access to the document in read-only mode. 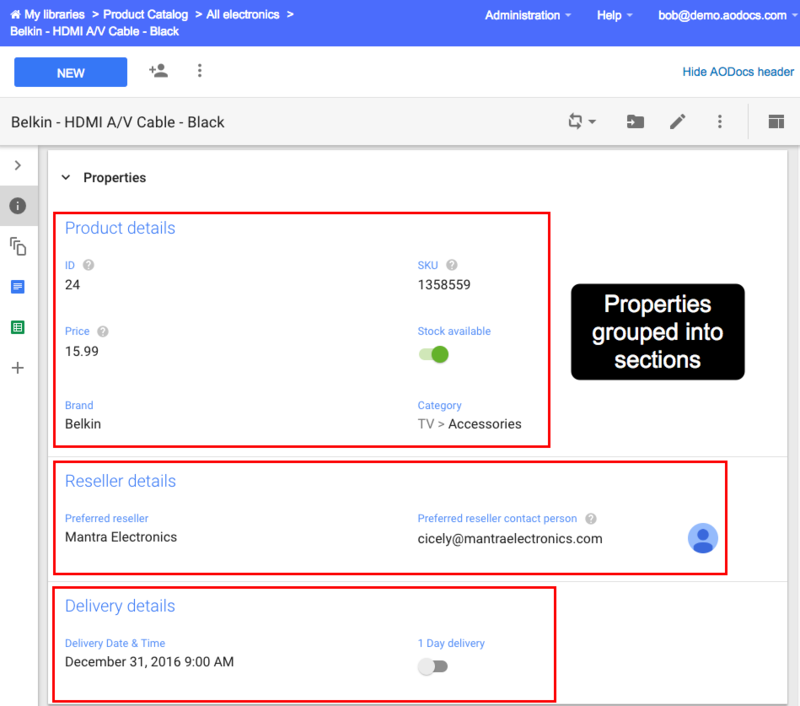 To improve visibility and make it easier to fill in document properties, you can now display a Properties tab in the right sidebar when you have the attachment displayed. This gives a side-by-side view, so you can see the content of your attachment and the document properties at the same time. 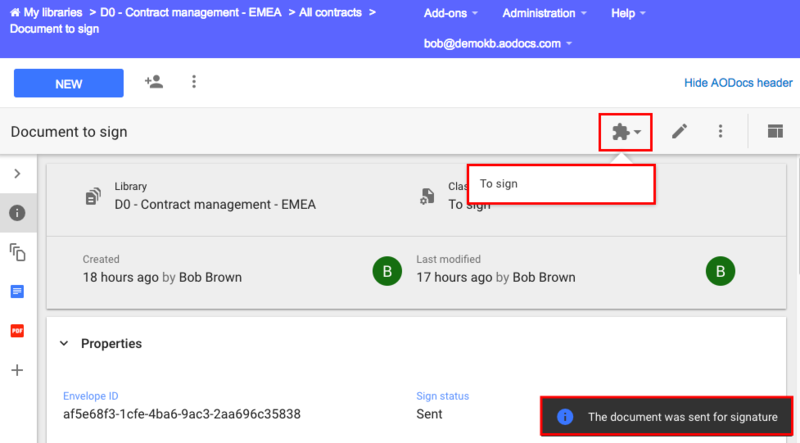 To better control the usage of the allocated number of AODocs licenses on the domain, users of the G Suite domain (or external users) can be pre-allocated a license so it’s reserved for them until they finally log-in AODocs. How are user licenses counted in AODocs? Users who are removed from the list of licensed users can no longer consume a license again for 6 months (from the date of the license removal). If a user is going to stop using AODocs, but plans to use it again in the future, you shouldn't revoke their license. Only revoke licenses of users if you’re sure they won’t use AODocs again. To move documents between libraries more efficiently, we’ve further enhanced the Export feature with this release. Work is still in progress; we’ll be making further improvements to the Export feature in future releases. 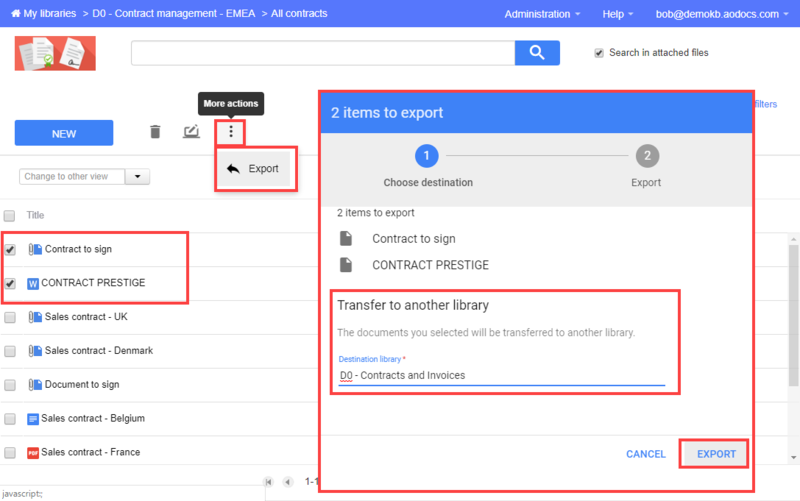 Library administrators can now export one or more documents from one Document Management library to another. Learn more: Export documents from Document Management libraries. If the export job takes some time, you can monitor its progress in a new dedicated page that opens via a link in the pop-up. 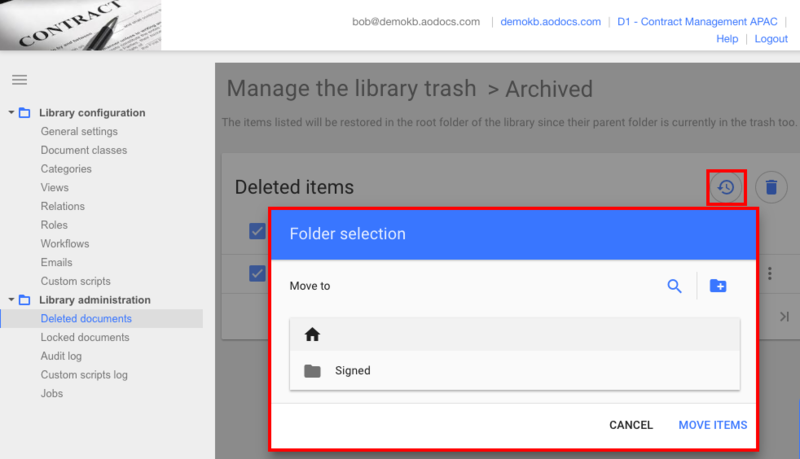 To restore documents and folders from the trash more efficiently, a folder selection pop-up opens if the parent folder is also in the trash. Library administrators can restore the items directly to the required folder. Before this release, items with a trashed folder structure were restored to the library root. Following up on Release 48, we have visually improved the display of multi-valued category properties. Also, the selection of several values at the deepest level of the category hierarchy is greatly simplified for contributors. Learn more: Edit custom properties. Triggering a viewer action from the document page is an advanced feature of AODocs. The button and drop-down menu is now closer to other actions and feedback is provided via standard “toasts” for a more standardized interaction with users. The context in which the action is triggered (especially the draft version versus the main version) is taken into account. The list of possible feedback is extended to have the ability to show a Copy to clipboard button with a customized text. When moving documents or folders, the folder selection pop-up defaults to the best context possible, allowing you to move the selected items to the parent, child or sibling directories. Learn more: Move documents or folders to a different folder. Also, when a user moves a document into a different folder, the user and date of last modification is not modified. This replicates the behaviour of Google Drive. The transparency of users involved in an incomplete parallel transition has been extended. The date and time at which users contributed to the parallel transition is now displayed along with the user's email address and (in a separate tab) their comment, if added. Note: Before Release 49, this information was available from complete transitions only. The common meaning of the button to open related items has finally been restored. Learn more: Use related items. 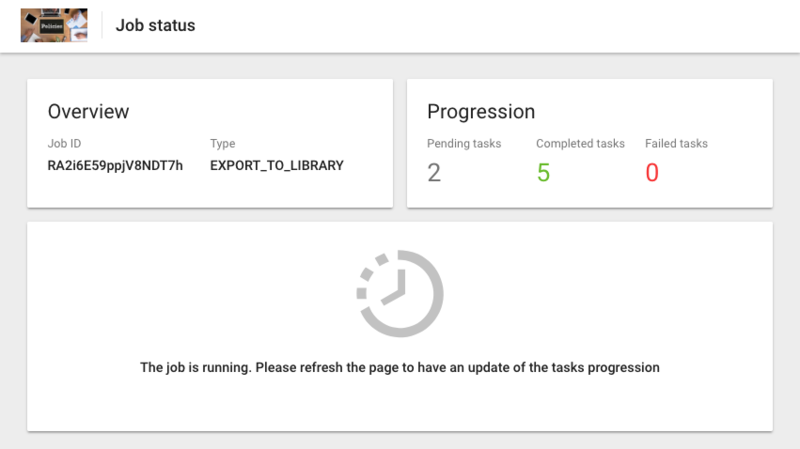 Administrators can appreciate a graphical preview of a configured workflow in AODocs. Learn more: View your workflow. 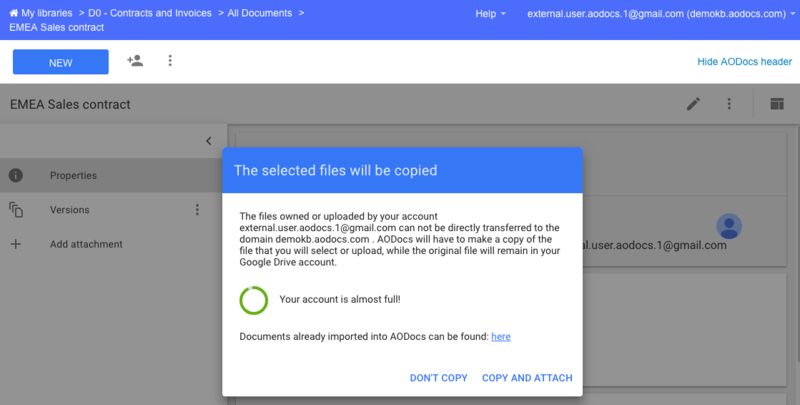 External users importing a file into a Document Management library may overload their My Drive because AODocs creates a copy of the original file in the user’s My Drive. If the user’s My Drive is close to being full, a warning appears inviting the user to clean up the original files. Following continuous and appreciated feedback, we are working on improving the data stored in the audit log events to have a proper coverage and eventually expose this information in AODocs. AODocs super administrators are implicitly administrators of all libraries on a domain. Yet most of the time they shouldn’t interact with the content of a document except if they’re involved in it from a business point of view. 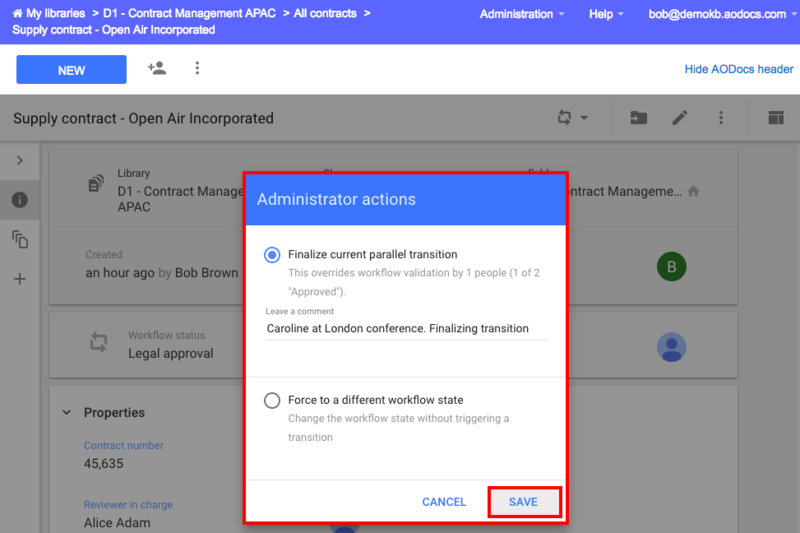 We now made sure the workflow transitions are not made available to super administrators by default. They can still trigger state changes and finalize current parallel transitions, like any library administrators. 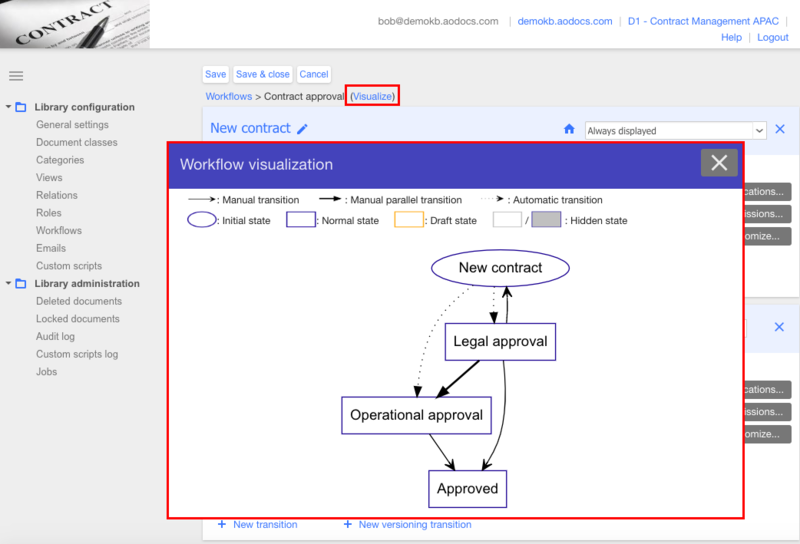 Learn more: Force workflow actions. Organize the properties of your document class into sections. In document templates, just like any other element of the document (except relations), library administrators will be able to customize the default folder where the document will be created. Learn more: Configure document templates. As part of the major, ongoing improvements to the selection of category values, library administrators will be able to make it mandatory to select the a terminal value in a multi-level category. We’ve started an important project to revamp the document creation flow. We want to offer a more consistent and visually improved menu. The action Duplicate will be hideable, to enforce a specific flow for new documents. In addition, when creating a document - only in Document Management libraries for now - a dedicated document creation page opens. In this context, library administrators will be able to specify whether properties are read-only, mandatory or hidden. Finally, we’re aiming be able to create a document via a dedicated document creation page by duplicating a source document. How can I use group properties into sections? I can use now or later? Thanks for your question. Our services team has contacted you with further information.